My POPSUGAR Must Have Box is on it's way but the suspense was killing me to I looked at the spoilers some of the other girls had posted on Makeup Talk. The box this month is said to have these items in it!! I'll try and post pictures when mine gets here looks like it should arrive before I leave for my trip! Don't Forget if you want to sign up for POPSUGAR you can get $5 off by using code REFER5 at checkout. What do you guys think of this months POPSUGAR Must Have Box? 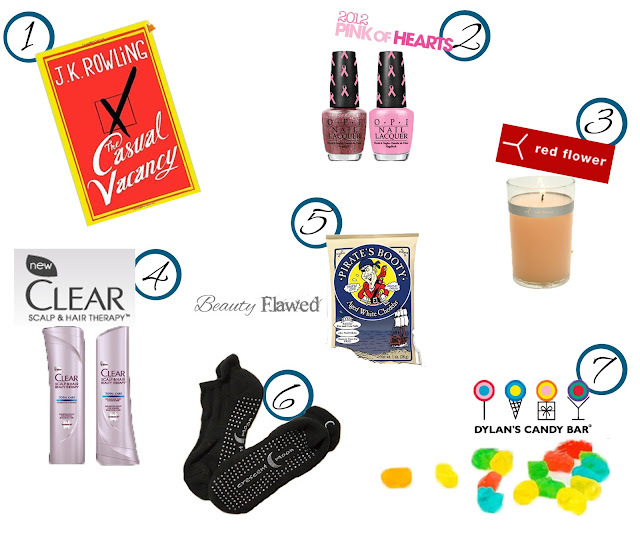 Image Credit: Crescent Moon ExerSock, Pirates Booty Aged White Chedder, Dylan's Candy Bar Gummy Bears, OPI Pink of Hearts 2012 Collection, J.K. Rowling The Casual Vacancy, Red Flower Candle, Clear Scalp and Hair Therapy. I am OBSESSED with pirates booty! Me too they have pretty tasty food. I love those OPI colors! They're really pretty! I wanted to let you know that your blog is being featured at this week's Harvest of Friends Weekend Blog Hop. I just found out about this, Might have to try it! The boxes have been pretty impressive this months isn't as impressive but Septembers box was going to be very had to top no matter what. Anxious to see the images you post! Found you on Our Everyday Harvest of Friends Weekend Bloghop... looking forward to your posts! It's looking like Monday or Tuesday I might get it but I'm leaving for a trip on Wed hopefully I will get it with enough time to take pictures! Yeah I'm excited to try it out! I'd love to have those gummy bears. Thank you for stopping by my blog and following. Glad you liked the story. I'm a new follower. Yep, that's what's in the box. The Clear are a great size. I can NOT believe they put in a brand new hard cover. I love the polish. Great box. I'm so glad I subscribe. Me too! I just got the box today and I'm really happy with the sizes of everything at least with this box I know I'm going to use it all. Hi! 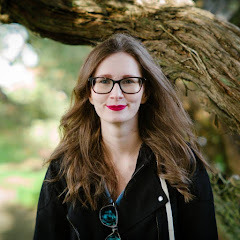 I came across your site on Our Everday Harvest Blog Hog- congrats! Love your site so much I had to follow :) Also, Clear Hair and Scalp Therapy is amazing, they're my newest favs!! Thanks for taking the time to stop by! I'm pretty excited to try them out they smell awesome!